The Divisions Arson Investigations Section is responsible for determining the origin, cause, and circumstances of fires (structural and wildland) that occur throughout Colorado. The division's investigators are sworn firefighters as well as sworn law enforcement officers. 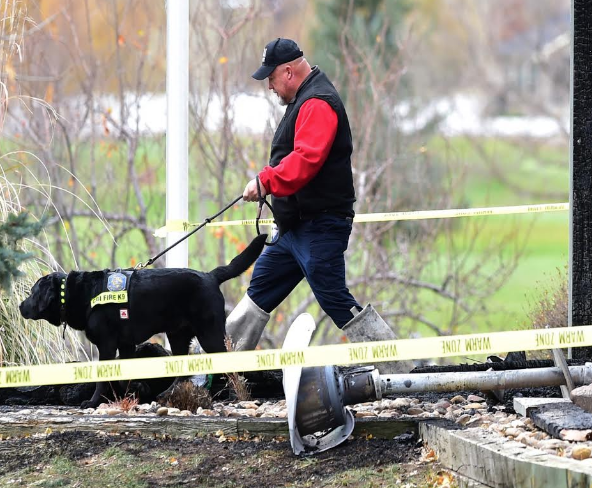 DFPC currently has one full-time Arson Investigator and K-9: Jerry Means and Riley, the Arson Dog. Fire and arson investigators examine the physical attributes of a fire scene and identify and collect physical evidence from the scene. This evidence is then analyzed to help determine if the cause of the fire was accidental or deliberate. During the scene examination, investigators may find evidence such as accelerants, tampered utilities, and specific burn patterns, which may indicate criminal activity. DFPCs Arson Investigator, Agent Jerry Means investigates hundreds of incidents each year. Incendiary blazes are responsible for a large percentage of the annual fire loss throughout Colorado. Too often the loss can be fatalities. These malicious and criminal acts affect everyone within our community. One of the hardest working state arson investigators gets around on four legs. Riley is a fun loving black lab who is described as a bull in a china hutch but if you get him on a fire scene he is a great evidence finder. Jerry and Riley have been working together since 2014 and have been to nearly 400 fires. Riley was trained in the accelerant K9 program in Maine which takes about 9-11 months to prep and imprint the K9 for the new handler. After the K-9’s initial training, Jerry traveled to Maine to meet his new partner and participate in a 5-week training program. Riley was that new partner. The program is sponsored by State Farm Insurance Company. (If you would like to see how that program works click here to watch: https://tinyurl.com/yd7petpa)The State Farm arson dog program has found that Labrador Retrievers are the best dogs for arson. They are agile, and have a keen nose for finding evidence. Another key fact is that labs don’t give an intimidating presence which allows for education and doesn’t scare kids. 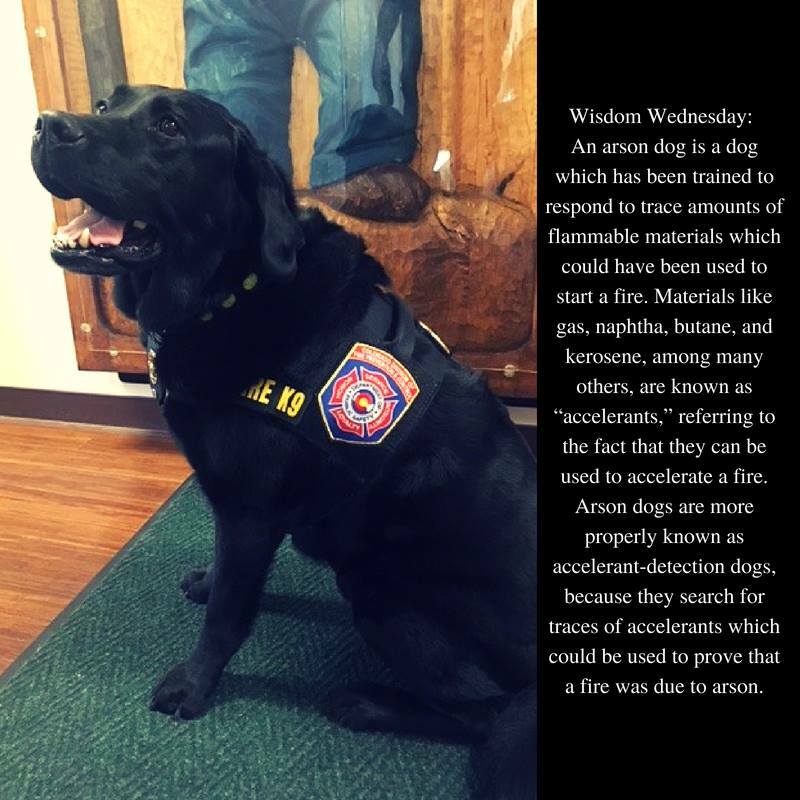 Riley is a super popular arson dog that is great at his job. Jerry has had three arson dogs over 20 years and has been on nearly 1700 fires. Jerry’s long investigative career has been dedicated to arson and has had some very humbling experiences. He got to go to Hollywood with his K-9 after being awarded the Top Law Enforcement/Arson K-9 in the United States by the American Humane Association (AHA). Jerry and Riley are currently National Ambassadors for the AHA and participate as celebrity judges in the American Hero Dog Awards. The travels to Hollywood have given Jerry and Riley the opportunity to meet Pauley Perrette (Abby of NCIS), Wynonna Judd, Peter Fonda, and the incredible Betty White. He, also, founded a non-profit to build a monument to honor the dogs in the arson program. The National Fire Dog Monument is located in Washington DC and titled “Ashes to Answers.” The monument is a beautiful representation of the firefighters and the dogs serving citizens across the country. Jerry loves to work for the fire service and with Riley. We are blessed to have two hard-working and talented arson investigators for the state of Colorado."